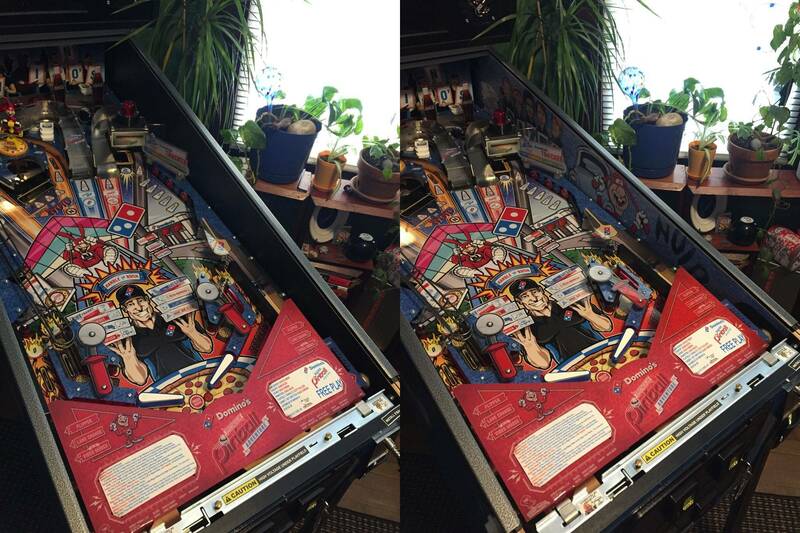 » Forum » Game manufacturers » Spooky Pinball » Domino's Pinball Official Thread - $5,299. Production started. 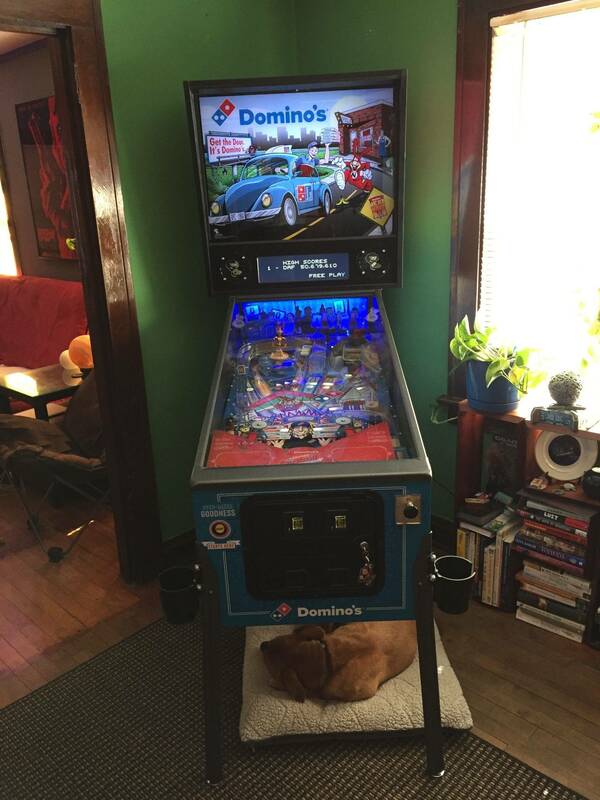 » Domino's Pinball Official Thread - $5,299. Production started. 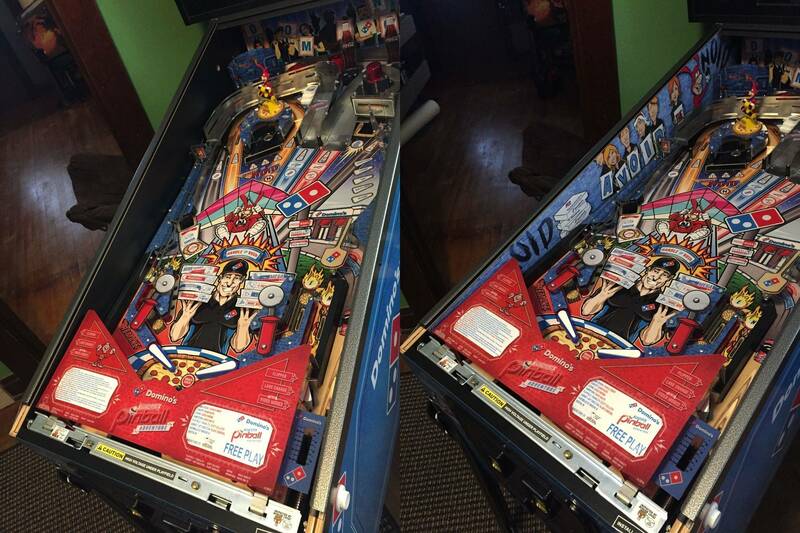 Domino's Pinball Official Thread - $5,299. Production started. There have been 132 images uploaded to this topic. (View topic image gallery). There are 678 posts in this topic. You are on page 13 of 14. All you can eat bulgogi? Sign me the hell up. Might be the only reason I ever visit California again. Uff so goddamn true. Sadly I had already stopped working at my theatre job and had an arcade job sitting 5 goddamn feet from that game when it came out. Good 1 solid hour bare minimum where no one was in that store it was all "Let's go Away." Man, I was only able to take about 28 seconds of that. Now it is stuck in my brain. These can still be ordered at TPF in just 2 weeks. Are there any of these on location yet? 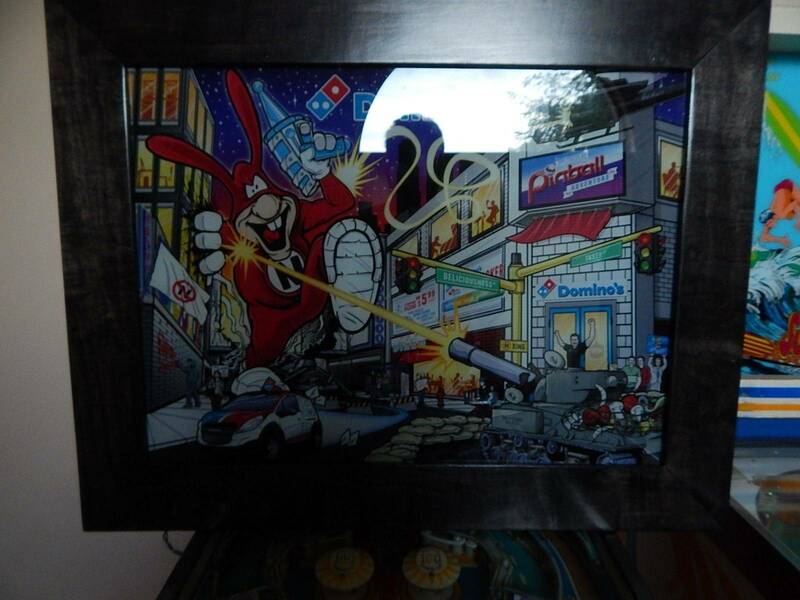 I have had a Domino's Game at Moonwalker Arcade in Vestal, NY for a few weeks now. Looks like yesterday was the cut off date to order. 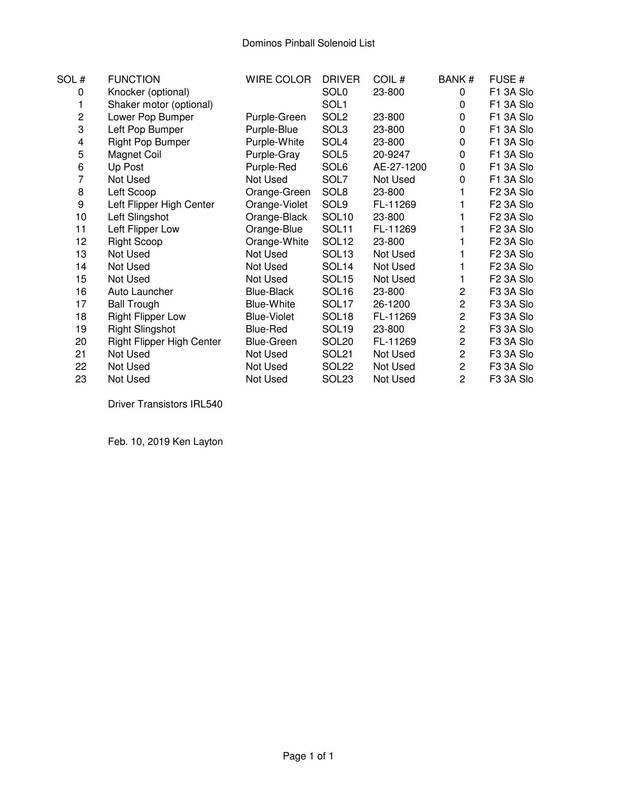 I ordered one last lear, #117. What's the game number at your arcade? I am bringing soon a Jetson and a friend of mine told me now that he want to have a domino, but the orders are now closed. have you contacted spooky to see if they have any remaining? I wonder what the final number of games sold was? I think they are planning only 150 regular varieties of the pin, in addition to the 75 LE's that sold out a while ago. It sounds like I will have #127, so almost sold out! Based on this post, it sounds like they cleared 200 counting the LEs. 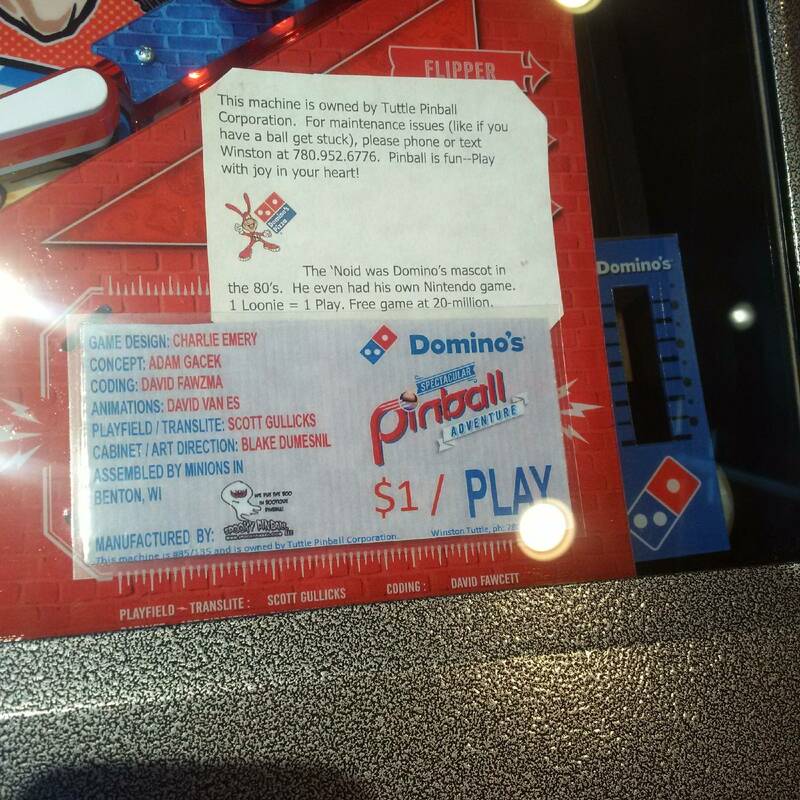 Are we allowed to know how many le's and standard Domino's pinballs were made? 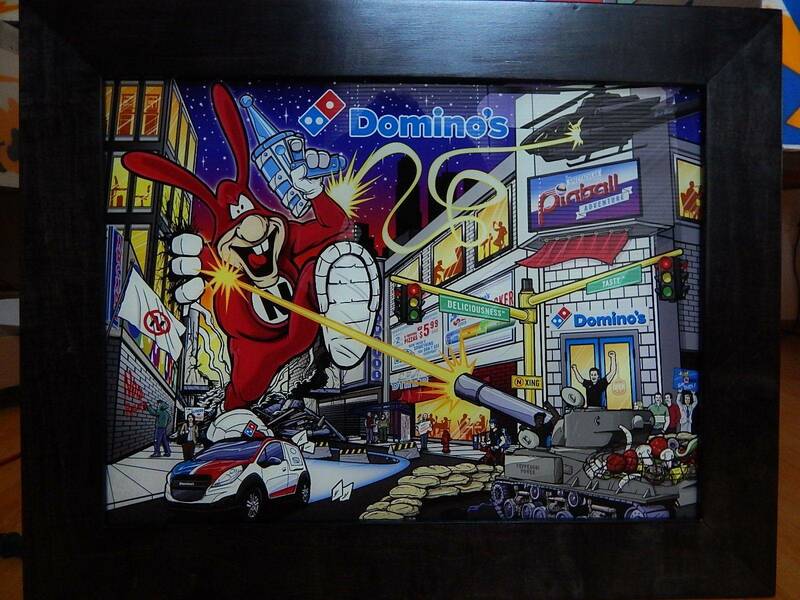 I just got my light box done for my Dominos backglass. I does not show well with ambient light. I also finally played on the most recent code. Much better balance now, more fun to shoot. - The sounds that are played during the bonus count (like "target master" for example) are grating and loud. They really need to be reworked into something more pleasant. That is an issue with the coin mech not the game or software. The game has no idea you have inserted a coin UNTIL it gets a credit pulse from the coin mech. If you need to insert 4 x 1/4's to get a $1 credit, the game has no idea you have inserted anything until you insert the fourth coin and the mech outputs a credit pulse. Pretty hard to do much about that in fact. Just got an e-mail from Kayte at Spooky advising my game would be ready to ship in 3-4 weeks! Pretty cool! As far as I know, mine will be the only one in Western Canada. Hoping to put it on location somewhere...just need to figure out where! 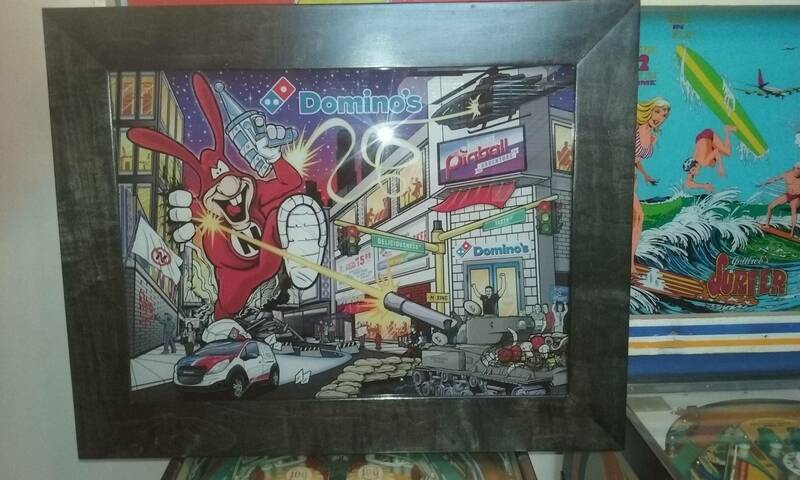 There are two Domino's locations that would be excellent candidates, as they are the newer style franchise layout with 'Pizza Theatre'. Anyone know if there's one in or close to NYC? I think it looks like a fun shooter. I'd like to play one someday. Huh? What kind of coin mech would that be? Every mech I have ever seen pulses per coin. Typically its just a dumb wireform to a micro switch. Maybe an electronic mech designed for reading different denominations from the same slot? Never seen that in a pinball machine though as they are considerably more expensive than a common mech. Do you consider Buffalo close to NYC? For someone in Canada, it is...and they definitely have one there! That's about a 6-8 hr drive depending where in NYC they are. I believe there is one at Moonwalker Arcade in Vestal, NY as well which would be way closer. If you're ever in Southeast Michigan, let me know and you can play mine. And a $10 Thruway toll. I thought this was a joke when I first read it, strangest theme in a long time. Looks pretty cool, looks fun to play. Just got my DOM. Any written rulesets for V005? Apron/Instruction Cards? None yet. I'm told they'll be on the website when rules are finished later this year. Picked up #123 yesterday and had people over for a Domino's pizza party. The table got exactly 69 plays throughout the night and people loved it. A really fun table even for newbies as shooting around with no goals is super fun and rewards you for hitting targets without doing any modes. A few players got really into it and posted some pretty good scores while completing modes. We even had the pizza delivery guy get a play on the table and he loved it. The dog loves it too. I'm really looking forward to digging into this table to see what all the modes are about. So glad I didn't sleep on this one. Glad you enjoyed the game last night. You kept Charlie up most of the night LOL he had to watch those Phantasm movies you gave him. We did pick up the alternate backglass and we plan on getting it framed at some point in the future. My wife loves Volkswagen so we're keeping that in game. I'm just happy we could take his mind off the basement for a little bit. We have fought that battle ourselves. Good luck. Glad you're enjoying the game mackey256. Thank you for supporting Domino's, Spooky and Domino's Partners Foundation. We had rule cards and then the fawzmagames updated the code, made the game 100x better but ruined the scorecards. We will hopefully get bd_designs to update them when the code is finalized. Here is a short rules primer I sent around to internal Domino's folks when they asked how to play the game. b. 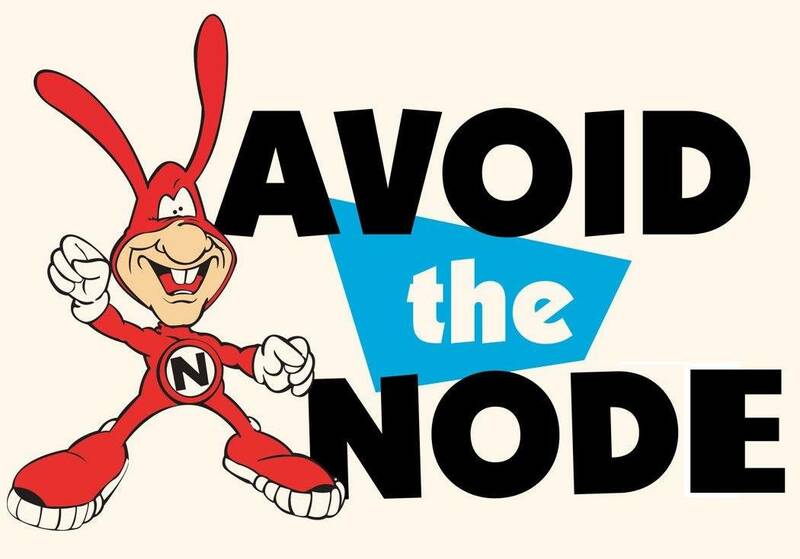 Hit the Noid a certain amount of times (it increases for each battle) or hit the Noid orbit to defeat the Noid. c.	Point values increase for each round of battles. a. 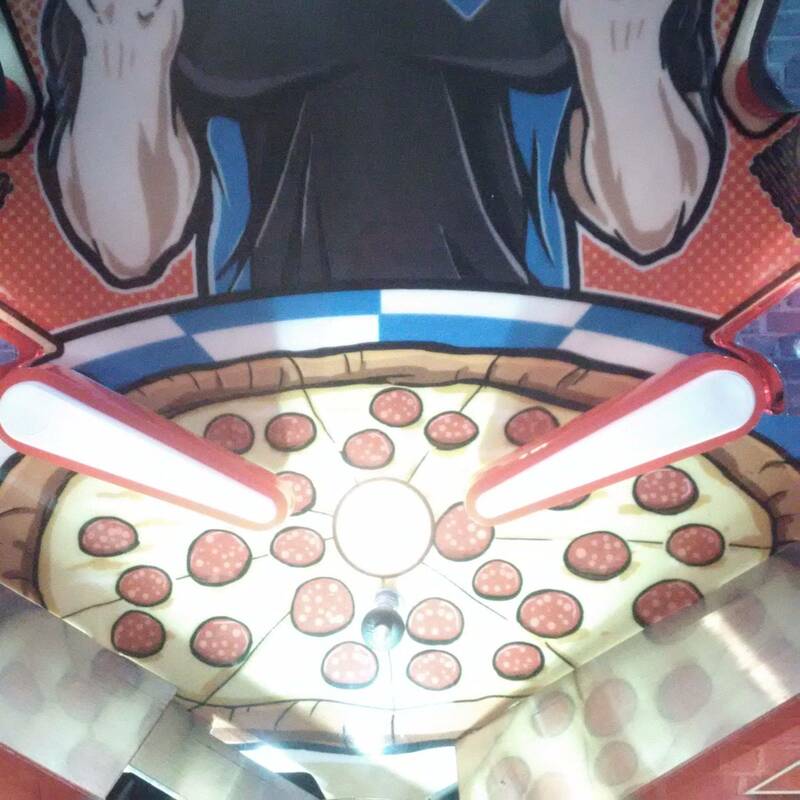 Qualify the three main modes (Make the Pizza, Pizza Dispatch and Lost Topping) by hitting the shots that are labeled with that name. 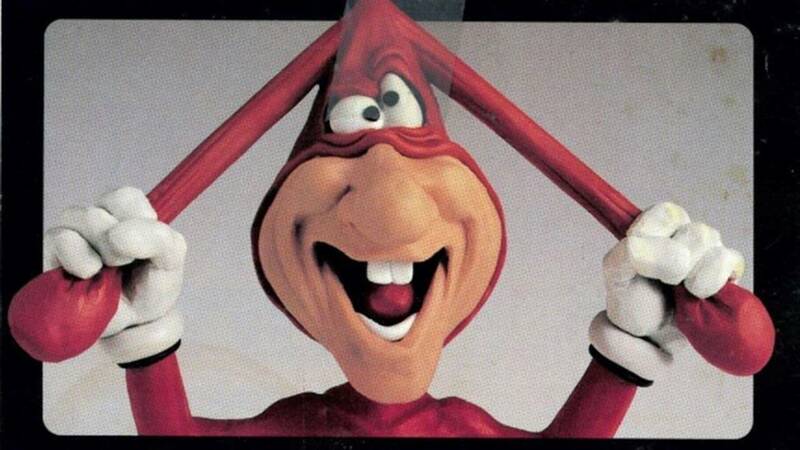 Make the Pizza is the outer orbit shot, Pizza Dispatch is the main ramp and Lost Topping is the Noid orbit and Mega Week is the Tracker targets. After you hit a certain shot three times, you will hear a retro video game audio cue that means that mode is qualified. The light on the pizza box held by the driver with that particular name will also flash when that mode is qualified and the light in front of the scoop under the pizza oven will flash whenever any of these modes is ready. b. You can increase the jackpot potential for each mode after you qualify it but before you start the mode by hitting more of that particular shot (up to three more shots to boost values). c.	Start the Operations Modes by hitting the scoop under the pizza oven. You can start more than one mode at a time to make it easier to hit jackpots and stack points. 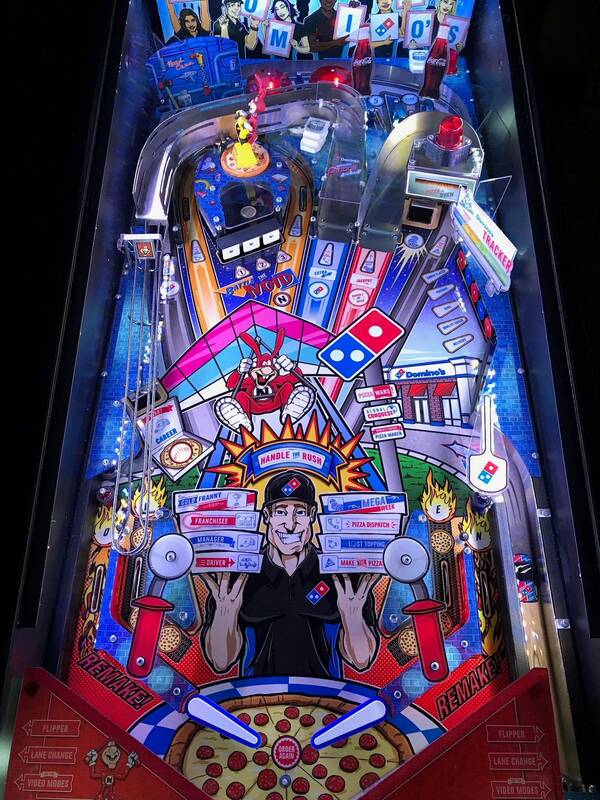 d.	When the mode starts, you will get a multiball, during the multiball, hit the flashing shots to qualify jackpots and then the oven ramp to collect jackpots. e.	Mega Week is qualified by hitting all the Tracker targets once. Then the Mega Week insert will light in front of the Oven Ramp. Hit that and then the Oven scoop and it starts. a. Qualify these by getting Pop Bumper hits (not easy) or hitting the pizza box scoop (counts as 3 Pop Bumper hits each time you hit it). b. After 10 hits, Driver is qualified. After 20 hits, Manager is qualified. 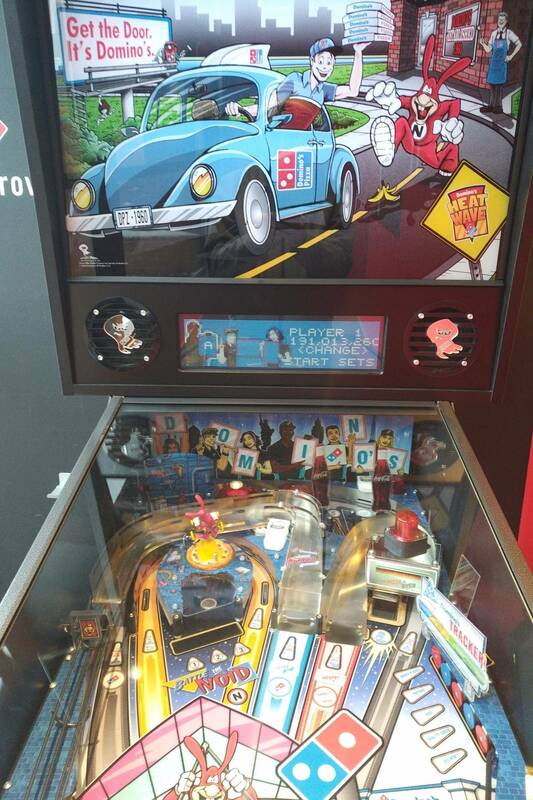 30 is Franchisee and Gold Franny is 40.
c.	After it is qualified, the pizza box held by the driver with the name of the mode will flash and the career mode light by the pizza box scoop will flash as well. 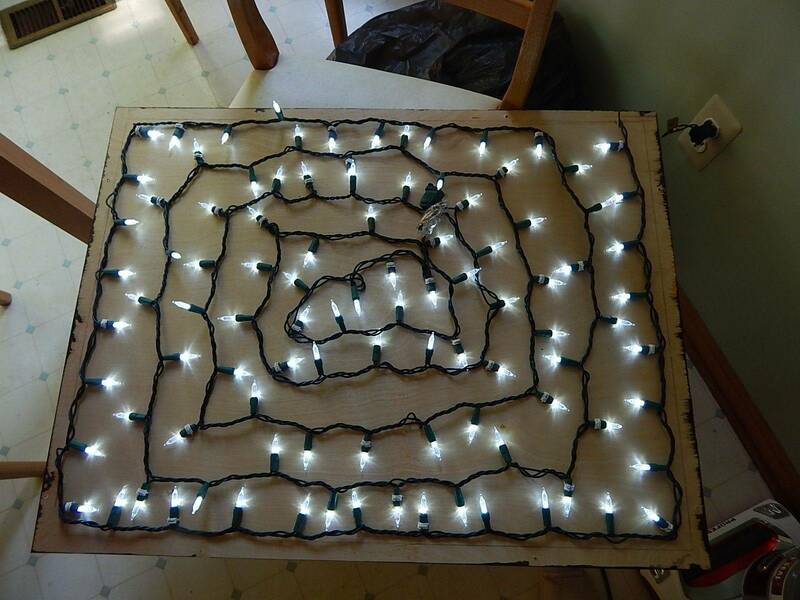 Hit the pizza box scoop to start the mode and begin a multiball. d.	I believe each one of these modes has the goal to hit the left orbit shot into the top of the game/pop bumpers to get points and then also hit the pizza box scoop to get more points. a. Spell O-V-E-N in the lanes to light the lock ball at the Pizza Oven ramp. b. A letter is qualified when it is lit. You can also change the lit lanes by hitting the flipper buttons so you don’t need to drain in order to get the O or the N. Time it so that when the ball is going down the inlanes, V or E, that light is unlit so it then will become lit. c.	Lock 3 balls and then hit either scoop to start Handle the Rush. d.	You cannot trap balls on the flippers in this mode as it is disabled. e.	Try to keep all three balls alive and hit the center ramp as much as possible for points. a. Hit all of these to light Mystery Award at the pizza box scoop and to qualify Mega Week mode by hitting the oven ramp and then the oven scoop. b. The integration of these into the game will be the thing that changes the most as we develop code. 6. Top 5 Star Lanes. a. Light both of these to increase your bonus multiplier. Fawzma and I have been communicating about rules updates and scoring balances. We will also record more voice callouts to include in this update. Thanks for the rule set Adam. After the pizza party/pinball party on Saturday we figured out a few of those but that list helps fill in the holes we had int he rules. We've been having a blast with this table. Thanks for making it available to the pinball playing public. Just wondering: does anyone find that their 'Handle the Rush' multiball doesn't act like it should? I believe the flippers are supposed to only work in short bursts (no craddling the ball). Mine work like normal when I'm in this mode. That is being fixed. I'm taking the next update a little slow as not to introduce any major bugs. I split HtR out into its own mode. It was also missing the no hold flipper function, that has been fixed. I'm having this tested before I move on. 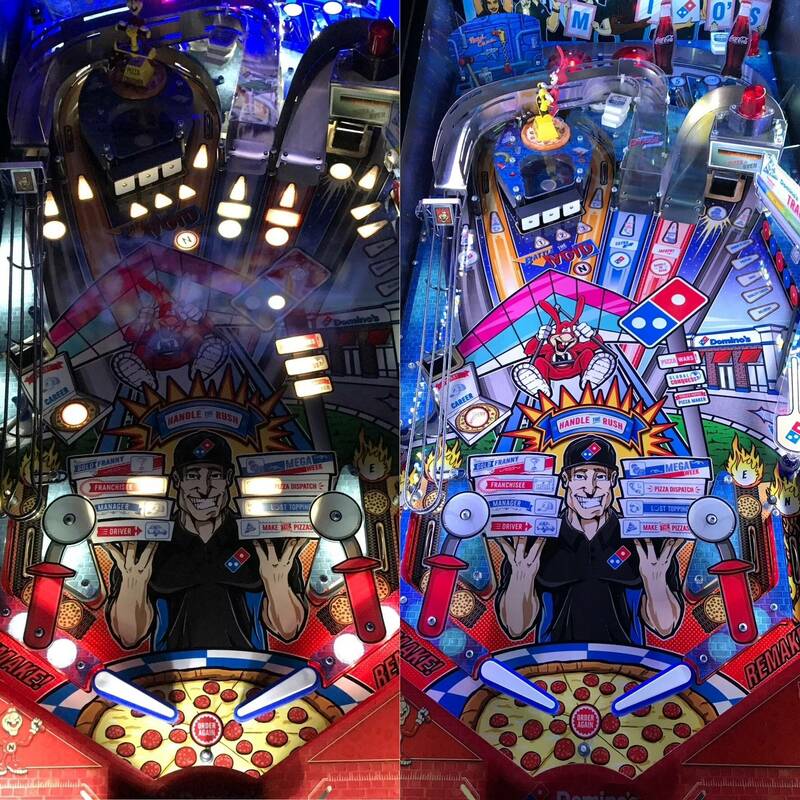 After the latest update all 2 ball multiball modes end when 1 of the 2 balls drains while the ball saver is still on. It saves the ball, but kills the mode. This makes the game unplayable. Thanks for the heads-up, Mr. Fawzma. Minor mod, but I thought I'd show my Domino's with red Superbands. I started another tread to focus on the rules and code. If people want to share their findings like this there. Made 'Pizza Wars'tonight. 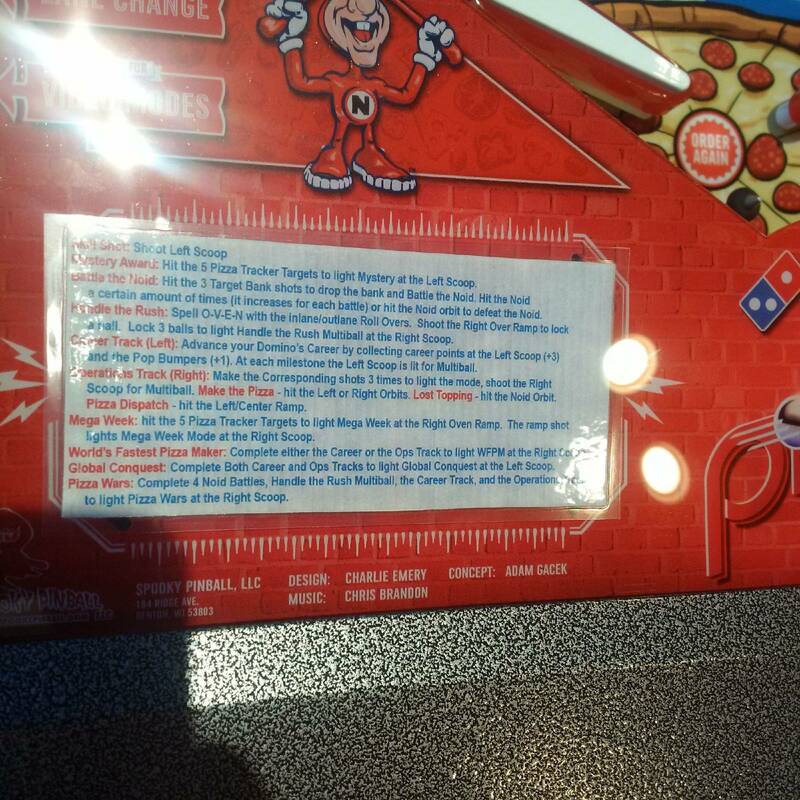 Very cool to see references to Pizza Hut and Little Caesars in there. No code or music though. I take it Mr. Fawzma is aware of this. Good fun in any event. Any ETA on a update? Mine is going on route and was hoping for a version with at least the multiball drain while ball save is on glitch fixed. What game code are you running? I had an issue where the game would not shoot another ball into the shooter lane after a multiball and it would throw a "check lane switch" error. Are you experiencing something simillar? If so, check what version of game code you are running. There might be a newer version. If not please explain more as I'm not understanding the issue you are having. As for balls not ejecting and getting the lane switch message, this is to prevent the coil from overheating and blowing a fuse. The ball is trying to eject from the trough but is never making it to the lane switch, so it will keep firing. What I may end up doing is, attempting the eject a few times, then give the coil a rest, then resume the eject after about 6 or so seconds. I've commented on the other thread about worlds fastest. That is a misleading light that should be killed off while that mode is running. 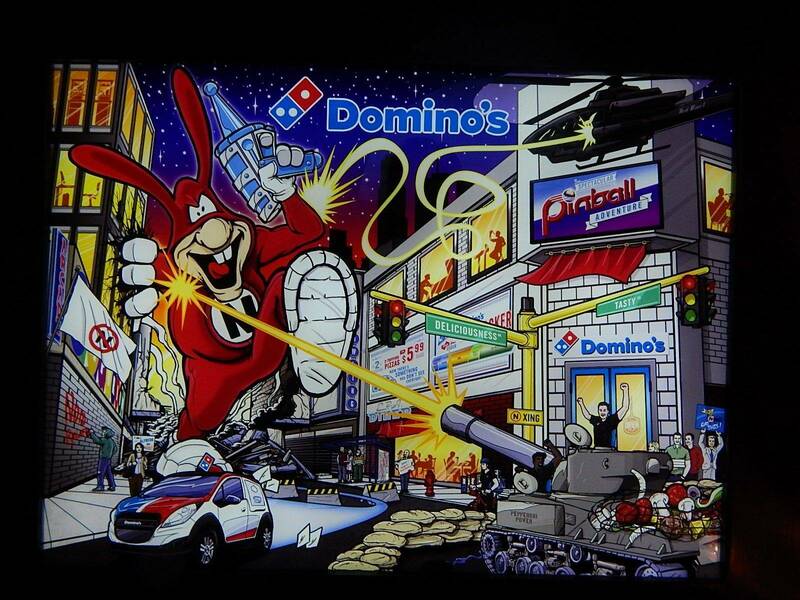 Anyone know how many Domino's were produced? There is a gentleman on here selling his for $5,400 (one of three presently on the market) and he states only 30 were sold to the public. That doesn't seem to make sense to me though, as I have #85, and another poster here has one in the 120's. Does the game have a replay feature? Or is it just not on by default? Related: where is Instant Info? Multi ball ball save seemed to last for several minutes - is this intentional? 1. Game is pretty dark without ambient light, I added spotlights to mine but then removed those and have added the PinStadium lighting which is incredible. 2. 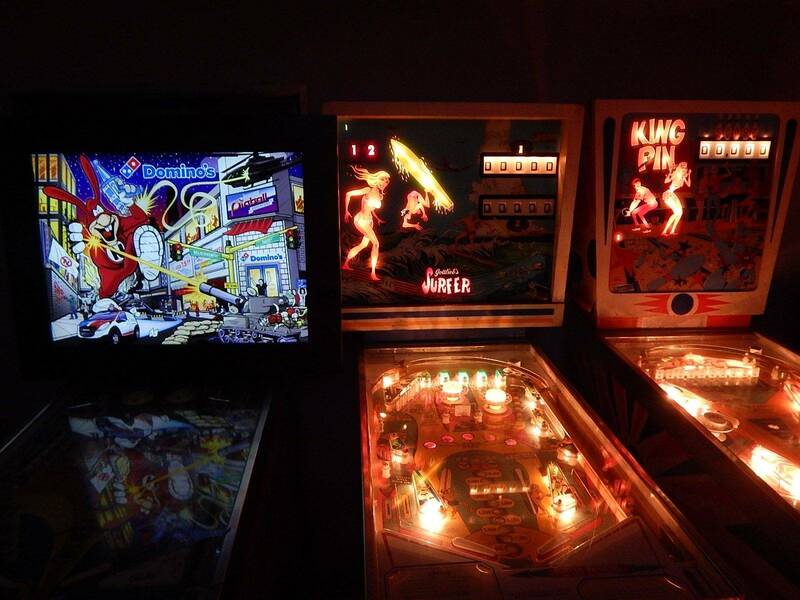 Multiball should not last several minutes unless you restarted a new one upon the end of the first. 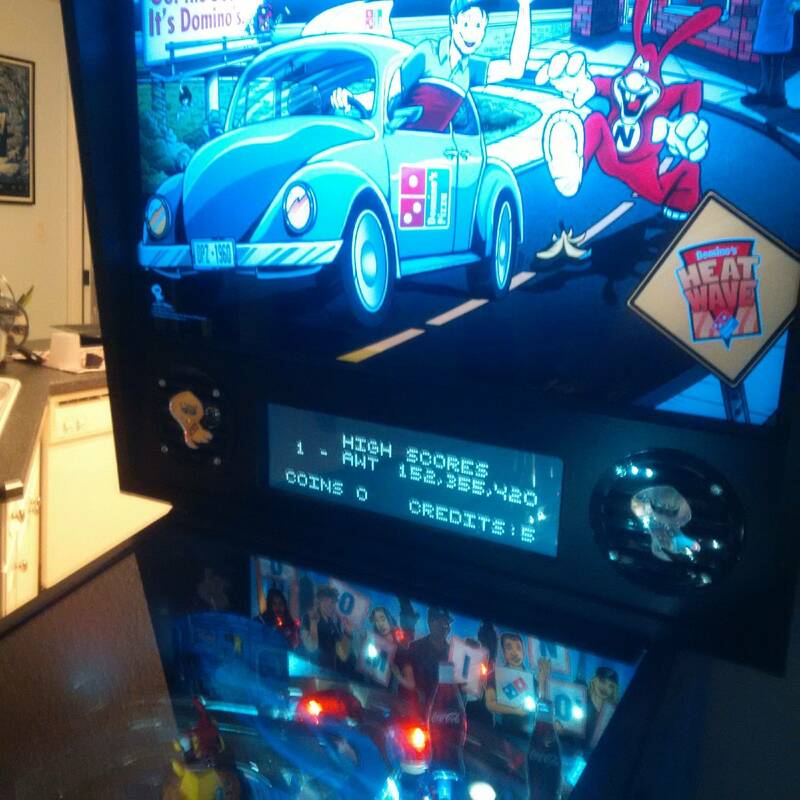 We did see a bug in early code when kevinbuffalo and the Buffalo Pinball crew came out to stream an early model that allowed Jay to have infinite multiball and contributed to my 0-5 record. I haven't seen that bug on my personal game since I got it. 3. We are actively working on a major code update (just installed beta code with some of the features last night) that we will eventually release to all owners. 4. Instant Info is to be added in the next code release. While waiting for the rules to be finalized I decided to make some temporary Instruction Cards. I haven't printed them yet but I thought I would share the photoshop file with anyone who wanted to. I left all the layers and text fields intact so this file can be updated when the rules do get finalized down the road. Once the official Instruction Cards come out I'll take this down. This was super helpful. I modified the price slightly (mine is on location). I'll post pics soon.